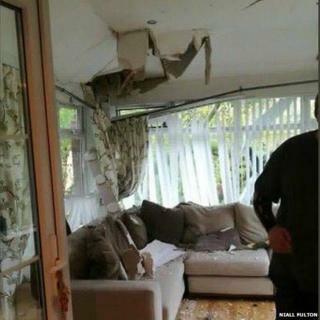 A County Antrim man was lucky to escape serious injury when a 70-ft tree crashed into a sunroom in which he was sitting during Storm Ophelia on Monday. The mature beech tree crashed into Tommy Dowds' house in Broughshane at about 12:35 BST on Monday. He said there had been "no noticeable warning - no creaking, or cracking". "If the tree had come down two or three feet closer to where I was sitting, it could have been a different story," he told BBC news NI. He estimated the tree - and another that fell from his neighbour's garden - was as tall as 80 feet. "I've had fears about the trees in the past being so close to adjacent residential property," he said. "The neighbours have been fantastic - tidying up what could be tidied up and boarding up what could be boarded up. Mr Dowds said he could only hazard a guess as to the the cost of repairs, but it would probably run into the tens of thousands of pounds as the sunroom would have to be replaced. As he awaited the arrival of the loss adjusters, he said he feared there could be also be structural damage to the main part of the house.